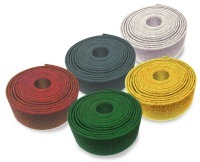 Corazzi Fibre offers a complete range of products of non-woven web for manual processes manufactured either by technologically advanced Rando equipments or traditional carding machine using top-quality fibres and resins. The used minerals include Aluminum Oxide or Silicum Carbide in different grits able to meet any request pertaining to their main applications. Further details are displayed in the Industrial web sheet. Rolls cut in optimal sizes to be used on both hand-operated or orbital machines. 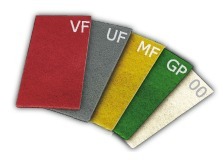 Pads in different grits and standard sizes to be used on both hand-operated or portable tool machines.